Excitement is building: in two weeks, we’ll be reunited with Vinyasa, woohoo! Between now and then, we’ll finish downsizing and drive 1,700 miles to our marina in Maryland. 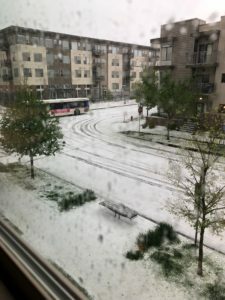 Yesterday’s hailstorm in our corner of Colorado, and the fierce storm that swept through our soon-to-be home were reminders of Nature’s power. Living aboard, we’ll be much more attuned to and affected by weather than we’ve been on land. Over the winter months, Allan has prepared for this transition by passing the test for the US Coast Guard’s OUPV Six-Pack Captain’s License, as well as complying with the associated requirements for CPR and first aid training, TWIC card, specialized medical evaluation and drug testing, plus documenting his sea time. It’s a lot, and I appreciate all his efforts on our behalf! We started downsizing in December, driving several car loads of “stuff” to Goodwill in order to take a final tax donation before the rules changed for 2018. Over the past few weeks, we’ve amped up donations to Goodwill, along with sales and giveaways on Craigslist and Nextdoor. We will be storing some keepsakes, a few boxes of household goods, and a couple of furniture pieces…for our eventual move back to land…some day, some where. For now, we look forward to the transition ahead: getting Vinyasa dewinterized and happilly splashed back into the Chesapeake Bay!